Ranked 33rd in the U.S. The State of Arizona is a state located in the southwestern region of the United States. The capital and largest city is Phoenix. Arizona is noted for its desert climate, exceptionally hot summers and mild winters. In contrast, the northern high country features pine forests and mountain ranges. Population figures for the year ending July 1, 2006, indicated that Arizona is the fastest growing state in the United States, exceeding the growth of the previous leader, Nevada. Arizona is a crossroad of culture and heritage intertwining many different traditions. The southern and central parts of the state are predominantly populated with Mexican-Americans. The north-central and northwestern counties are largely inhabited by residents of English ancestry. The northeastern part of Arizona has many Native Americans. Arizona is projected to become a minority-majority state by the year 2035, if current population growth trends continue. In 2003, for the first time, there were more Hispanic births in the state than white (non-Hispanic) births. The state is a recognized center of Native American art, with a number of galleries such as the Heard Museum showcasing historical and contemporary works. Sedona, Jerome, and Tubac are known as budding artist colonies, and small arts scenes exist in the larger cities and near the state universities. Arizona is home to such spectacular landforms as the Painted Desert and the Grand Canyon as well as many other National Forests, Parks, Monuments, and Native American reservations. The striking landscape forms a breathtaking backdrop for everything from spiritual pursuits to hiking and mountain biking trails, as well as Hollywood movie production. Arizona is located in the Western United States as one of the Four Corners states. It borders New Mexico, Utah, Nevada, California, touches Colorado, and has a 389-mile (626-km) international border with the states of Sonora and Baja California in Mexico. Arizona is the sixth largest state in area, after New Mexico and before Nevada. Of the state's 118,000 square miles (306,000 km²), approximately 15 percent is privately owned. The remaining area is government forest and park land, recreation areas, and Native American reservations. A view of an Arizona sunset looking over a lake. Horsethief Lake near Crown King, Arizona. Monument Valley on the Navajo Reservation is famous for its scenery. Arizona is best known for its desert landscape, which is rich in xerophyte plants such as cactus. It is also known for its climate, which presents exceptionally hot summers and mild winters. Less well known is the pine-covered high country of the Colorado Plateau in the north-central portion of the state, which contrasts with the southern portions of the state. Like other states of the Southwest, Arizona has an abundance of topographical characteristics. More than half of the state features mountains and plateaus and contains the largest stand of Ponderosa pine in the United States. The Mogollon Rim, a 2,000-foot (600 m) escarpment, cuts across the central section of the state and marks the southwestern edge of the Colorado Plateau, where the state experienced its worst forest fire in 2002. Arizona belongs firmly within the Basin and Range region of North America. This region was shaped by prehistoric volcanic eruptions, followed by a cooling off and related subsidence. The entire region is slowly sinking. The Grand Canyon is a colorful, steep-sided gorge in northern Arizona. The canyon is largely contained in the Grand Canyon National Park—one of the first national parks in the United States. The canyon was created by the Colorado River cutting a channel over millions of years. It is about 277 miles (446 km) long, ranges in width from 4 to 18 miles (6 to 29 kilometers) and attains a depth of more than 1 mile (1.6 km). Nearly two billion years of Earth's history have been exposed as the Colorado River and its tributaries cut through layer after layer of sediment and the Colorado Plateaus was uplifted. Arizona is home to one of the largest and most well-preserved meteorite impact sites in the world. The Barringer Meteorite Crater is a gigantic hole in the middle of the high plains of the Colorado Plateau, about 25 miles (40 km) west of Winslow. A rim of smashed and jumbled boulders, some of them the size of small houses, rises 150 feet (46 m) above the level of the surrounding plain. The crater itself is nearly a mile wide, and 570 feet (174 m) deep. Due to its large area and variations in elevation, the state has a wide variety of localized climate conditions. In the lower elevations, the climate is primarily desert, with mild winters and hot summers. The summer months of May through August bring a dry heat ranging from 90–120°F (32–48°C), with occasional high temperatures exceeding 125°F (52°C). Due to the primarily dry climate, large temperature swings often occur between day and night, with some as large as 50°F (28°C) in the summer months. The northern third of Arizona is a plateau at significantly higher altitudes and has an appreciably cooler climate, with cold winters and mild summers. Extreme cold temperatures are not unknown; cold air systems from the northern states and Canada occasionally push into the state, bringing temperatures below 0°F (–18°C) to the higher parts of the state. Arizona has an average annual rainfall of 12.7 inches (322 mm), which comes during two rainy seasons, with cold fronts coming from the Pacific Ocean during the winter and a monsoon in the summer. The monsoon season occurs from the middle of July through August and brings lightning, thunderstorms, wind, and torrential, if usually brief, downpours. It is rare for tornadoes and hurricanes to occur in Arizona, but there are records of both occurring. Arizona is famous for its cacti and Ponderosa pines. Saguaro National Park and Organ Pipe Cactus National Monument preserve these. Other plants that grow in the desert are mesquite, ironwood, and paloverde trees. Forests cover one-fifth of the state, and Arizona has more Ponderosa pines than any other state. Gila monsters (the only poisonous lizards in the United States) live in the Southern Desert, as do scorpions, geckos, and rattlesnakes. White-tailed and mule deer, elk, bighorn sheep, bobcats, coyotes, porcupines, black-footed ferrets, and pronghorns are among the mammals. The nearly 300 species of birds include sandhill cranes, eagles, hummingbirds, and quail. 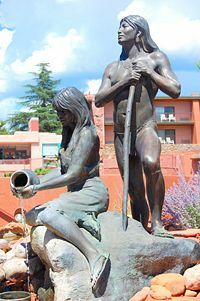 Sinagua fountain statue by Susan Kliewer, Sinagua Plaza, Sedona, AZ. The Sinagua were a pre-Columbian cultural group occupying an area in central Arizona. 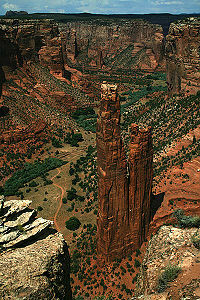 Spider Rock at Canyon de Chelly National Monument, Arizona. Disagreement exists over the etymology of the name "Arizona." The two most likely explanations are that it derives from a Basque phrase aritz onak, "good oaks," or that it comes from an O'odham phrase alĭ ṣonak, "small spring". The name Arizonac was initially applied to the silver mining camp and later (shortened to Arizona) to the entire territory. Paleo-Indians arrived in Arizona about 12,000 years ago but eventually disappeared. The Anasazi settled in the northwestern section of the state about 2000 years ago and built homes among the cliffs. The Hohokam arrived from Mexico around 300 C.E. Both groups had moved on due to a prolonged drought at the time of European contact. Marcos de Niza, a Spanish Franciscan, explored the area in 1539. The expedition of Spanish explorer Coronado entered the area in 1540–1542 during its search for Cíbola. Father Kino developed a chain of missions and taught the Indians Christianity in Pimería Alta (now southern Arizona and northern Sonora) in the 1690s and early 1700s. Spain founded fortified towns (presidios) at Tubac in 1752 and Tucson in 1775. When Mexico achieved its independence from Spain in 1821, what is now Arizona became part of the Mexican state Nueva California, also known as Alta California. In the Mexican–American War (1847), the United States occupied Mexico City and forced the newly founded Mexican Republic to give up its northern territories, including Arizona. The Treaty of Guadalupe Hidalgo (1848) specified that the United States pay Mexico $15 million in compensation. In 1853 the land below the Gila River was acquired from Mexico in the Gadsden Purchase. 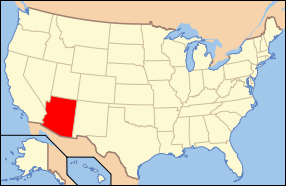 Arizona was administered as part of the Territory of New Mexico until southern New Mexico seceded from the Union as the Confederate Territory of Arizona on March 16, 1861. Arizona was recognized as a Confederate Territory by presidential proclamation by Jefferson Davis on February 12, 1862. This was the first official use of the name. A new Arizona Territory, consisting of the western half of New Mexico Territory, was declared in Washington, D.C., on February 24, 1863. The new boundaries would later form the basis of the state. Arizona became a U.S. state on February 14, 1912, becoming the last of the contiguous states to join the Union. Cotton farming and copper mining, two of Arizona's most important statewide industries, suffered heavily during the Great Depression, but during the 1920s and 1930s tourism began to develop into the important Arizona industry it is today. Dude ranches gave tourists the chance to experience the flavor and life of the "old West." Arizona was the site of German and Italian POW camps and Japanese-American internment camps during World War II. Arizona's population grew tremendously after World War II, in part because of the development of air conditioning, which made the intense summer heat more comfortable. The state's population in 1910 was 294,353. By 1970, it was 1,752,122. The percentage growth each decade averaged about 20 percent in the earlier decades and about 60 percent each decade thereafter. A sunset in the Arizona desert near Scottsdale. The climate and imagery are two factors behind Arizona's tourism industry. The 2004 total gross state product was $187 billion. Arizona currently has the 21st largest economy among states in the United States. The state's per capita income is $27,232, 39th in the United States. Early in its history, Arizona's economy relied on what was termed the "Five C's": copper, cotton, cattle, citrus, and climate (tourism). At one point Arizona was the largest producer of cotton in the country. Copper is still extensively mined from many expansive open-pit and underground mines, accounting for two-thirds of the nation's output. The state government is Arizona's largest employer, while Wal-Mart is the state's largest private employer. In 2001, 161,166 Arizonans were employed in the high-tech sector, accounting for about 8.3 percent of total private-sector employment of more than 1.9 million. High-tech payroll in 2001 was $2.2 billion, or 14.7 percent of the private-sector total. High-tech employment was led by software and computers, with 34,314; electronics components manufacturing, 30,358; aerospace manufacturing, 25,641; architectural and engineering services, 21,378; telecommunications, 21,224; and instruments manufacturing, 13,056. Arizona State Capitol in Phoenix. The Arizona legislature is bicameral and consists of a 30-member Senate and a 60-member House of Representatives. Each of the thirty legislative districts has one senator and two representatives. Legislators are elected for two-year terms. Each legislature covers a two-year period. In 2008 the majority party was the Republican Party, which has held power in both houses since 1993. Arizona's executive branch is headed by a governor elected for a four-year term. The governor may serve any number of terms, though no more than two in a row. In more recent years, the Republican Party has generally dominated Arizona politics, with the Republican presidential candidate carrying the state every time with the sole exception of Bill Clinton in United States presidential election, 1996. In recent years, the Republican Party has also dominated Arizona politics in general. The fast-growing Phoenix and Tucson suburbs became increasingly friendly to Republicans from the 1950s onward. On March 4, 2008, John McCain effectively clinched the Republican nomination, becoming the first presidential nominee from the state since Barry Goldwater in 1964. McCain won the state though he lost the national election. Maricopa County, the fourth-largest county in the country and home of Phoenix, dominates Arizona politics. It is home to almost 60 percent of the state's population, and most of the state's elected officials live there. It has voted Republican in every presidential election since 1948. In contrast, Pima County, which includes Tucson, and most of southern Arizona has historically been more Democratic. While Tucson's suburbs lean Republican, they tend to be more moderate than Republicans in the Phoenix area. Between them, Maricopa and Pima counties cast almost three-fourths of Arizona's total vote, and account for a substantial majority in the state legislature. Arizona rejected an anti-gay amendment in the 2006 midterm elections, the first state in the nation to do so. Gay marriage was already illegal in Arizona, but this amendment would have denied any legal or financial benefits to unmarried homosexual or heterosexual couples. In 2008, Arizona passed an amendment to the state constitution to define marriage as a union of one man and one woman, ensuring the definition of marriage can never be changed by a judge or the Legislature. As of 2006, Arizona had an estimated population of 6,166,318, which was an increase of 213,311, or 3.6 percent, from the prior year and an increase of 1,035,686, or 20.2 percent, since the year 2000. New population figures for the year ending July 1, 2006, indicated that Arizona is the fastest growing state in the United States, with 3.6 percent population growth since 2005, exceeding the growth of the previous leader, Nevada. Phoenix, the largest city in the state, is the capital. Tucson is the state's second largest city, located 110 miles (180 km) southeast of the Phoenix metropolitan area. The Tucson metropolitan area crossed the one-million-resident threshold in early 2007. It is home to the University of Arizona. Yuma, center of the third largest metropolitan area in Arizona, is located near the borders of California and Mexico. It is one of the hottest cities in the United States with the average July high of 107 degrees Fahrenheit. The city also features sunny days about 90 percent of the year and attracts many winter visitors from all over the United States. Flagstaff is the largest city in northern Arizona, and at nearly 7000 ft elevation, is a stark contrast to the desert regions typically associated with Arizona. Flagstaff is home to 57,391 residents and the main campus of Northern Arizona University. According to 2003 U.S. census estimates, Arizona has the third highest number (and the sixth highest percentage) of Native Americans of any state in the Union, representing more than ten percent of the country's total Native American population. Only California and Oklahoma have more Native Americans. The perimeters of Phoenix, Tucson, Prescott, and Yuma abut Indian reservations. The largest ancestry groups in Arizona are Mexican (21 percent), German, English, Irish, and Native American. The southern and central parts of the state are heavily Mexican-American, especially in Santa Cruz County and Yuma County near the Mexican border. The north-central and northwestern counties are largely inhabited by residents of English ancestry. The northeastern part of Arizona has many American Indians. African Americans have had a relatively small presence in Arizona, but their numbers are increasing due to in-migration from other states, especially California, the Midwest and the Northeast. The African American population of the Phoenix metropolitan area doubled between 1990 and 2005. As of 2000, 74.16 percent of Arizona residents age 5 and older spoke only English at home and 19.52 percent spoke Spanish. Navajo is the third most spoken language at 1.89 percent. Public schools in Arizona are separated into about 220 local school districts, which operate independently but are governed in most cases by elected county school superintendents. In 2005, a School District Redistricting Commission was established with the goal of combining and consolidating many of these districts. Higher education in Arizona is governed at the university level by the Arizona Board of Regents or the ABOR, a 12-member body. Public schools are Arizona State University, Northern Arizona University, and University of Arizona. The community college systems in Arizona are among the best in the United States. Water has always been and will continue to be a significant factor affecting Arizona's growth and prosperity. So much groundwater (drawn from underground) has been removed, largely for agriculture, that some land is starting to sink. The Central Arizona Project is a system of dams, pumps, and canals that brings water from the Colorado River to Phoenix and Tucson, but this practice has a detrimental effect on the ecology downstream. Strict conservation laws help manage water use. ↑ 1.0 1.1 1.2 2005 American Community Survey. Retrieved from MLA Language Map Data Center. Retrieved January 29, 2012. ↑ 3.0 3.1 3.2 Elevations and Distances in the United States. United States Geological Survey (2001). Retrieved January 29, 2012. ↑ Paul R. Sheppard, Andrew C. Comrie, Gregory D. Packin, Kurt Angersbach, and Malcolm K. Hughes. December 1999. The Climate of the Southwest Institute for the Study of Planet Earth. Retrieved November 18, 2008. ↑ Timothy Anna et al., Historia de México. (Barcelona: Critica, 2001), 10. ↑ Sons of Confederate Veterans. ARIZONA ORDINANCE OF SECESSION Retrieved November 18, 2008. ↑ Daniel Scarpinato. November 5, 2008. Ban on gay unions solidly supported in most of Arizona Arizona Daily Star. Retrieved November 18, 2008. ↑ US Census Bureau. Table 1: Estimates of Population Change for the United States and States, and for Puerto Rico and State Rankings: July 1, 2005 to July 1, 2006 Retrieved November 18, 2008. ↑ Les Christie. December 25, 2006. Growth states: Arizona overtakes Nevada CNNMoney.com. Retrieved November 18, 2008. ↑ Modern Language Association. Most spoken languages in Arizona Retrieved November 18, 2008. ↑ The Association of Religion Data Archives. Religious Affiliations 2000 - Arizona Retrieved November 18, 2008. Anna, Timothy, et al., Historia de México. Barcelona: Critica, 2001. Bayless, Betsy, Secretary of State. 1998. Arizona Blue Book, 1997-1998. Phoenix, State of Arizona. Bright, William. Native American Place Names of the United States. Norman: University of Oklahoma Press, 2004. Thomas, David M. Ed. 2003. Arizona Legislative Manual - Retrieved December 12, 2007. All links retrieved November 22, 2016. This page was last modified on 22 November 2016, at 21:28.